Love and Hip Hop cast member and one of the realest female rappers to ever do it, Remy Ma, will be performing at the Trocadero on Saturday, April 30th. The show is one of Philadelphia Black Pride’s many events. Tickets are available now. One of the greatest R&B bands of our time, Mint Condition, will be sliding through Philly on Saturday, April 23rd. Yesssss, the folks behind our favorite 90s Slow Grind"cuts including “ Quit Breakin’ My Heart (Pretty Brown Eyes)” and “What Kind of Man Would I Be” will be performing at Harrah’s Philadelphia. Tickets for this show are available now. Hot off the presses! Y'all know how much we love Tweet’s new album, right? So, you can only imagine how excited we were when we saw that she will be coming to the TLA on May 26th. Tickets go on sale this Monday!!! 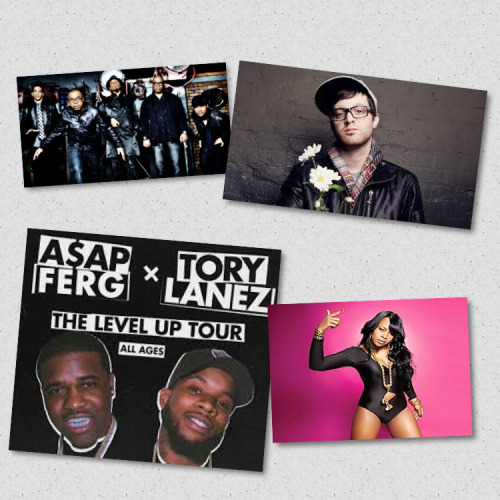 Two of hip hop’s biggest acts, Tory Lanez and A$AP Ferg, will be touring together for the Level Up tour! They will be performing at the Fillmore on May 28th. Get your ticket now! Retro-soul crooner and DJ Mayer Hawthorne will be performing at Union Transfer on June 28th. Tickets are available for purchase now. Did Elle Varner finally get her “Refill?” Beats us. However, we can confirm that she’ll be performing at Philly’s World Cafe Live on May 5th. Tickets for the show are available now. Also, one of the most hotly-anticipated R&B tours will be coming to Philly. Anthony Hamilton and Fantasia will be performing at the Mann on June 3rd. If that date rings a bell, it’s the day before that epic Roots Picnic andBeyonce weekend. So yup, Philly is going to have the best Black Music Month ever and we can’t wait! Tickets are available via pre-sale NOW! The password is SINGING. (If that isn’t the most fitting password of all time…) Get your ticket before it sells out.